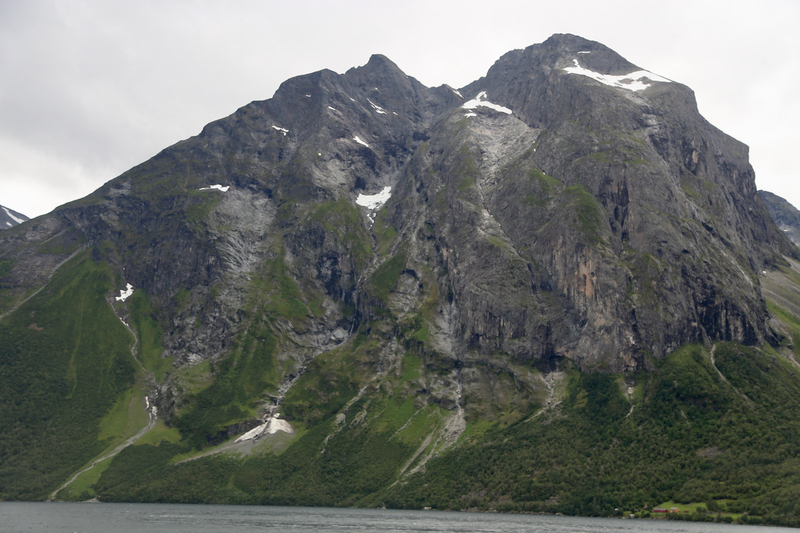 This mountain is located next to Eikesdalsvatnet. 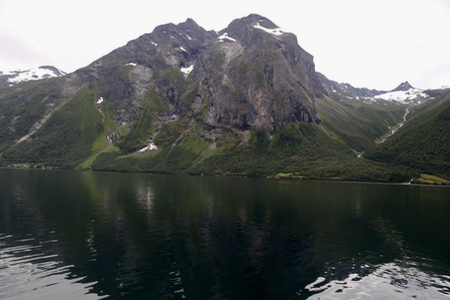 This lake is between the villages Åndalsnes and Sunndalsøra. One can easily get there by car from any of these locations. 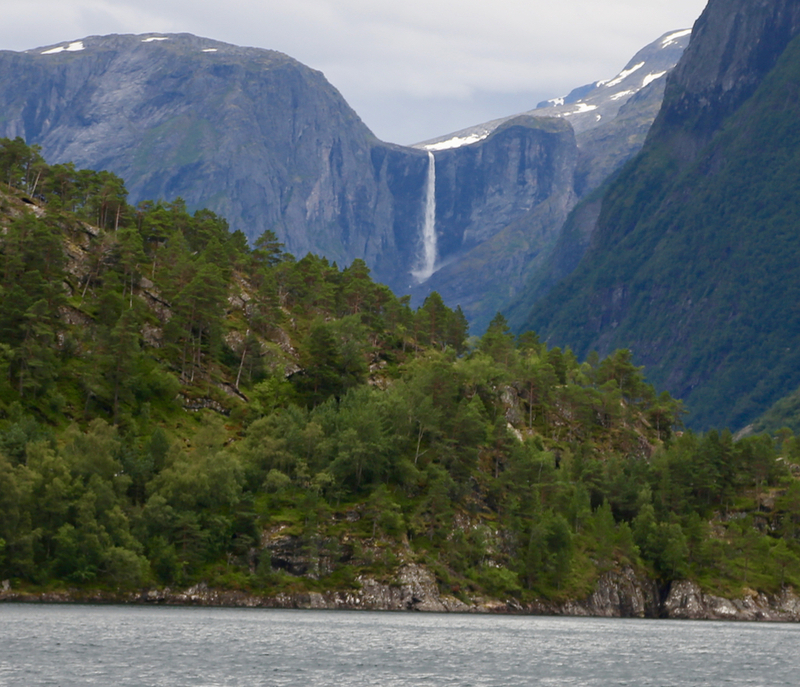 As you drive to Eresfjord, continue south along the road that runs on the east side of lake Eikesdalsvatnet. This road has signs for Eikesdalen, a small place at the south end of the lake. 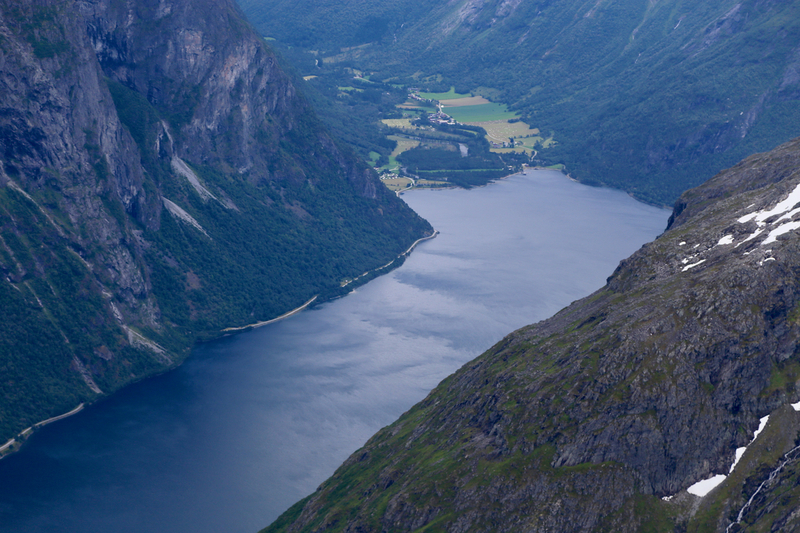 Long before getting there, the road runs through a tunnel that is more than 4 kilometer long. Immediately after exiting this tunnel, turn right at the small place called Vike. Keep right in order to drive down to the lake itself, there is good parking. 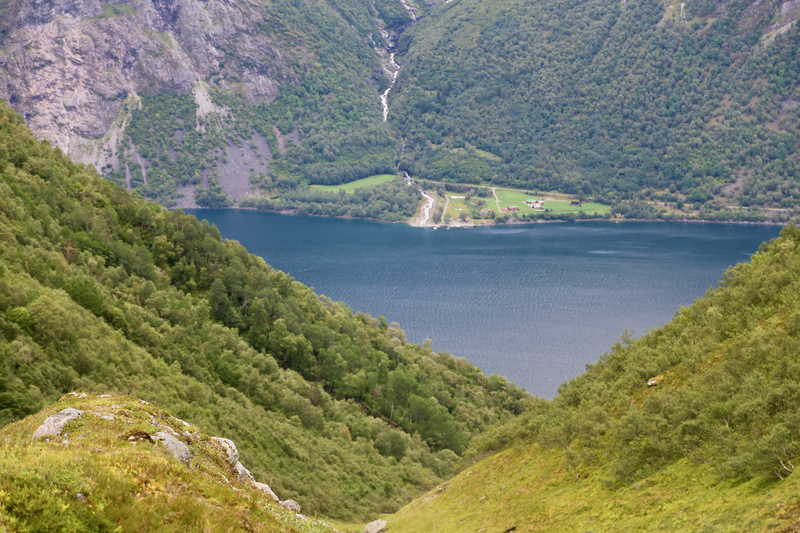 The trail starts at the opposite side (the west side) of Eikesdalsvatnet. 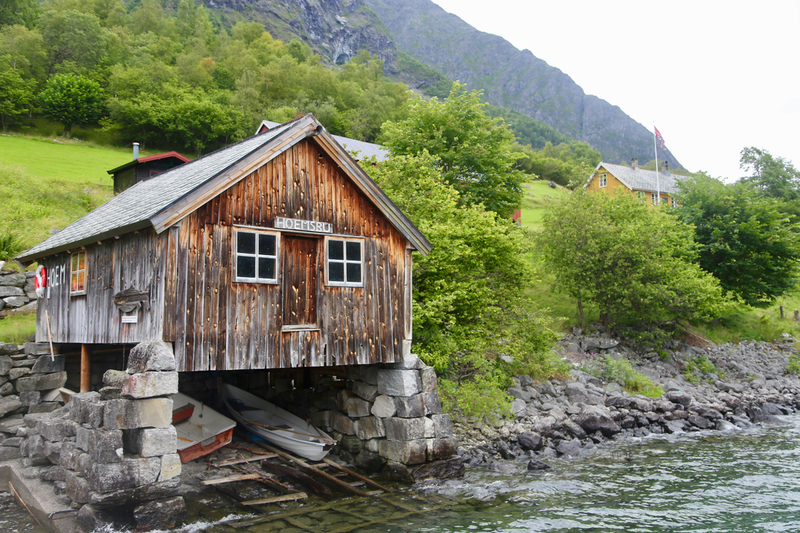 One shoul call ahead and agree on boat transportation with the people living at the Vike farm. The phone number is 71234515. The crossing cost NOK 200 in 2017. 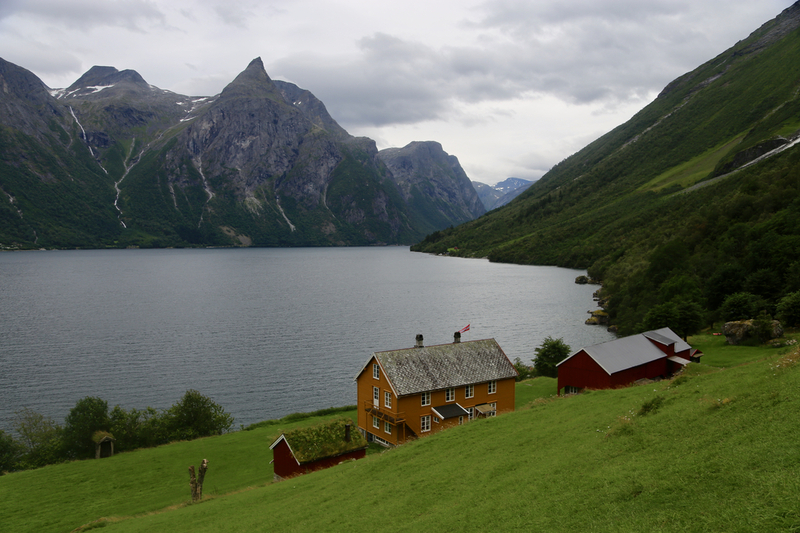 From the pier (boat landing at Hoemsbu), walk by the houses, then ascend up the grass in the natural way and pick up the red, T-marked trail. The trail ascends gently on the left side of the river. At about elevation 530 meter, there is a river fork and the trail crosses the first stream on a small bridge. Next, the trail ascends more steeply to a distinct, flat viewpoint where one should leave the main trail. Pick up a small trail that runs left, through some birch-bush, then uphill on nice terrain. One may loose the trail here (I did). Contine uphill, aiming for the ridge that hides the lake Svartevatnet (1075m) behind it. There is a small top on this ridge. 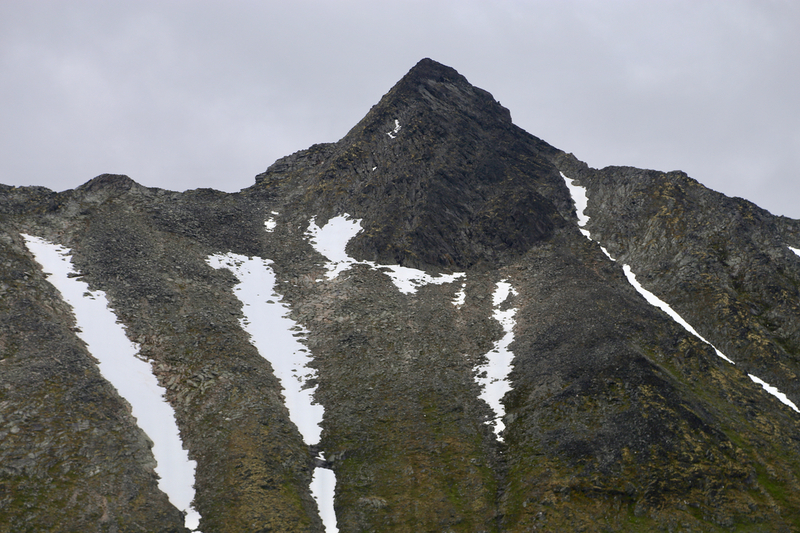 Climb up (easy slopes) on grass to the right of this summit. When you are almost up, turn left and contour around (and below) this top, then descend slightly to reach the outlet of the lake. Crossing is easy as most of the water flows deep below the rocks. The ascent starts here. Aim more or less directly for the peak as you do an ascending traverse of the slope. Hiking is easy. If the gullys that run directly downslope have snow, then consider ascending on snow which is somewhat more efficient. 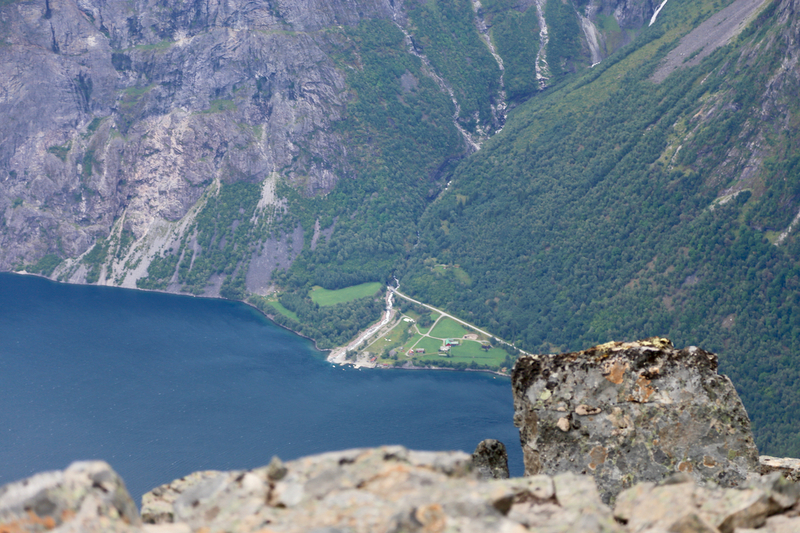 Higher up, move right in order to avoid a big field of seemingly quite big boulders. Continue up the main gully that will get you to the east slope with a nice view back down to Vike. From here, several lines that provide fairly easy ascent (a bit further) run paralllel to each other. The key is now to move up the first such line, then find the easiest spot to move right to the next line etc. The last such line will lead you to a small local col on the main ridge (ie. you will again look down the west slope). 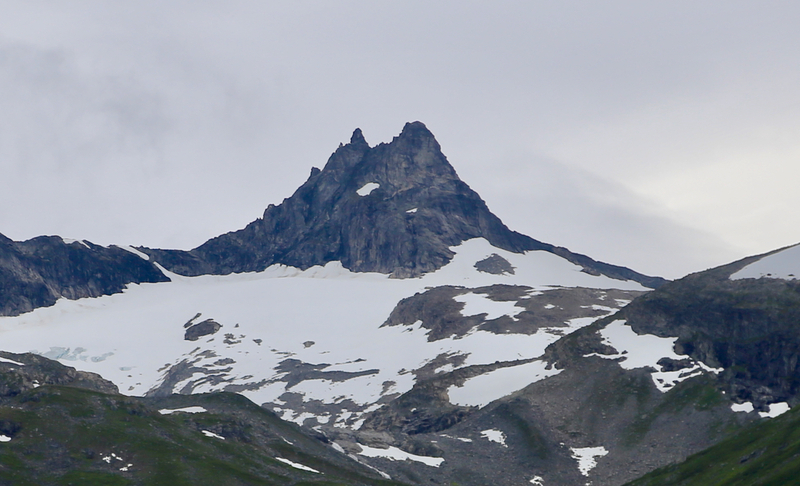 Only about 30 vertical meter remain and the very clear ridge that leads directly to the summit can be followed. It is easy to walk up just on the left side of this top ridge. 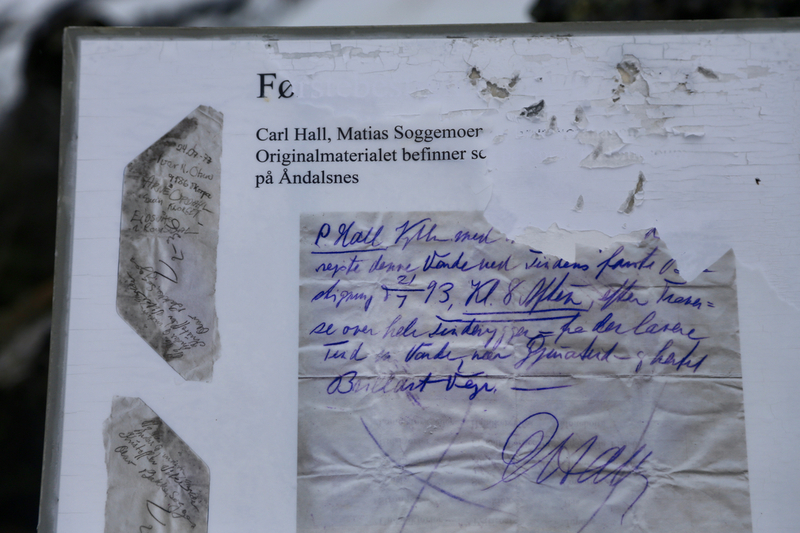 There is a copy of the note left behind by the 3 men that made the first ascent at the snall cairn. This mountain was first ascended on 21. July 1893 by Carl Hall, Mathias Soggemoen and Erik Norahagen. I arrived at Vike in the late evening and had agreed with Vike to get a boat ride across to the hut Hoemsbu the next morning at 0800. He showed up already at 0750, so by 0800, I stepped ashore and was ready to start walking uphill. The trail was pretty nice and it was a fine morning. 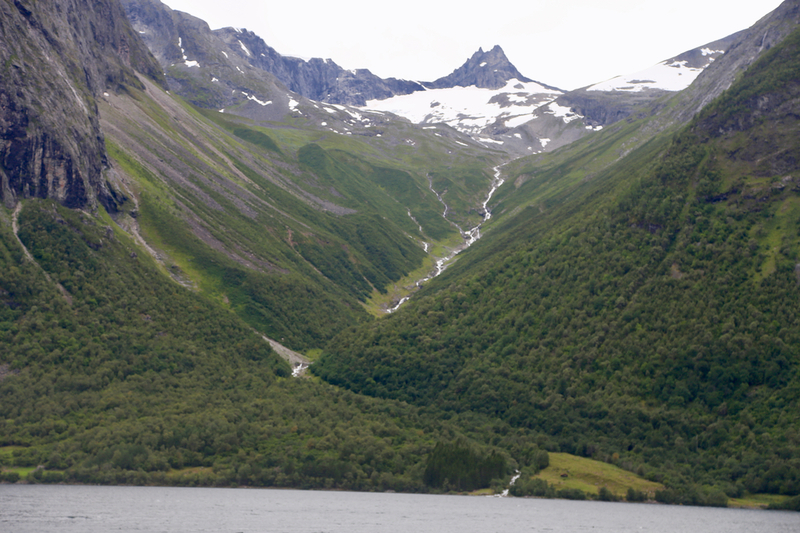 The route runs up a valley pointing directly towards the well known Gjuratind. I passed the river fork and crossed the bridge around 0900, then the route climbed more steeply to reach the small, flat plateau by 0930. I picked up the small trail and followed it until he terrain turned so nice that people obviously do not feel the need for a trail anymore. Continuing uphill, I reached a small moraine that went across, it had a small trail on its top, but again It sort of vanished in the uphill. 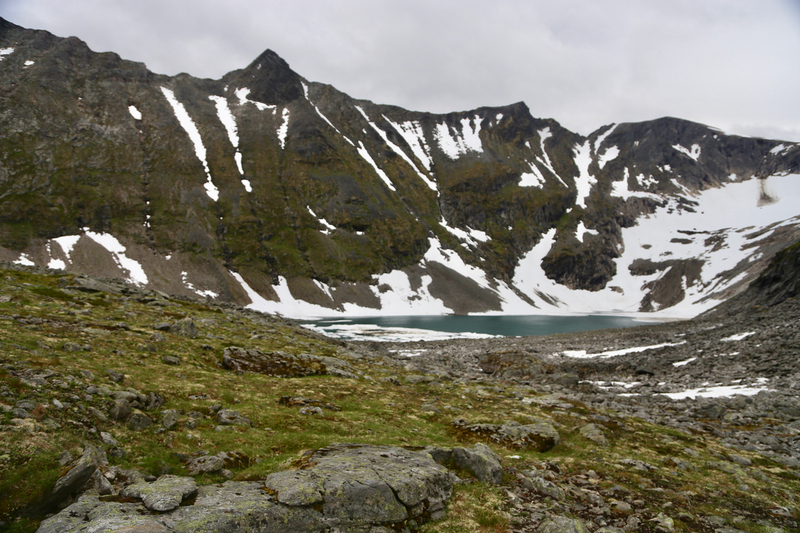 Easy terrain brought me to the outlet of lake Svartevatnet. The mountain looked very steep, but as is often the case, less so when getting really close. Thus, traversing up across the slope that culminates in the peak itself was easy. After giving the peak a careful look, I decided to try up the big gully that formed a natural extension of the slope I had been ascending, to the peak itself. This worked out well and soon I could again look down to Vike. 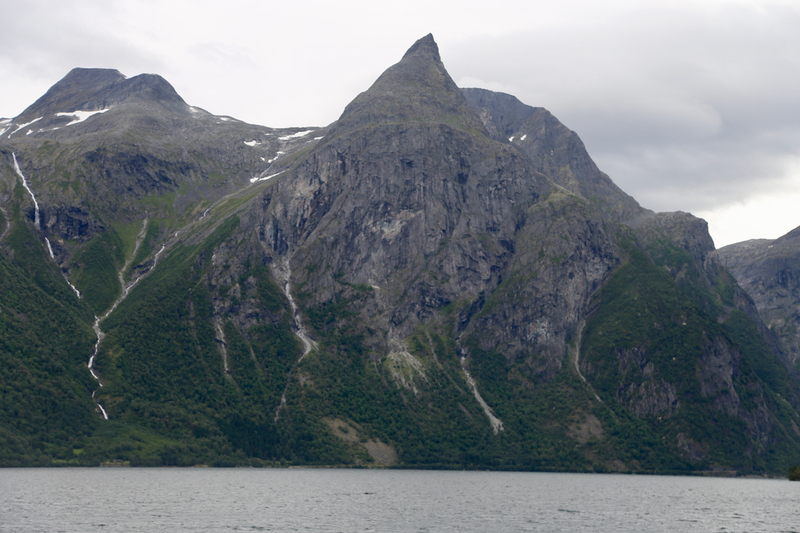 It became clear that the mountain had a number of parallel features that one could ascend along, the key would be to gradually connect right, since each of these routes were likely to dead end at the steep face falling off down to lake Eikesdalsvatnet. This strategy worked fine. I was very careful in a few spots as everything was wet after recent rain. In particular, the wet moss was treacherous, seemingly not attached to the rock. After a bit of careful scrambling I arrived at a small col from where I could see down the upper west face again. 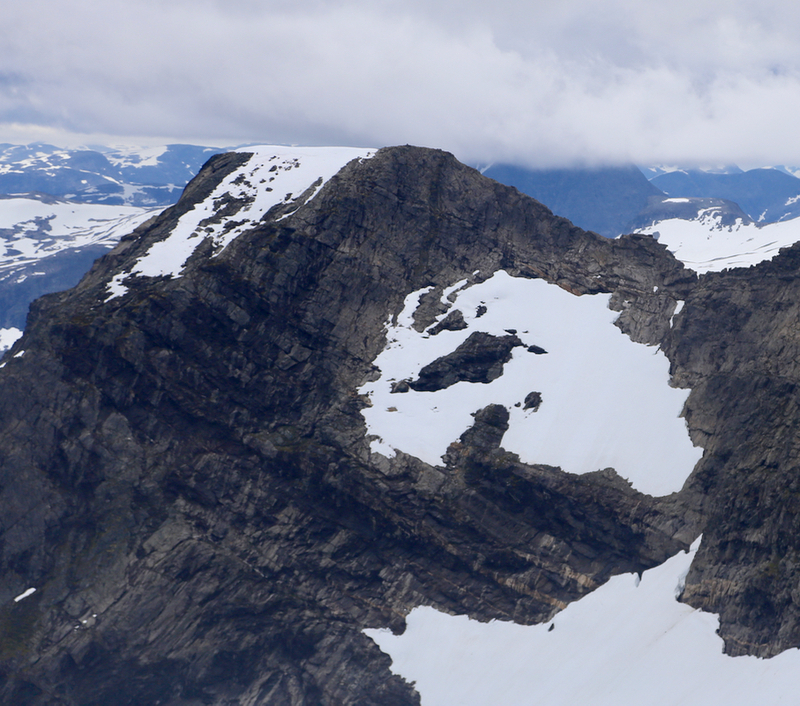 This was only about 30 vertical meter below the summit and the remaining nice little ridge looked good. I arrived at the summit at 1315. The weather was not great, but OK. I had a pretty good view all around. Across to Hauduken, my next destination. Gjuratind looked good guarding the top of the valley that I had ascended. 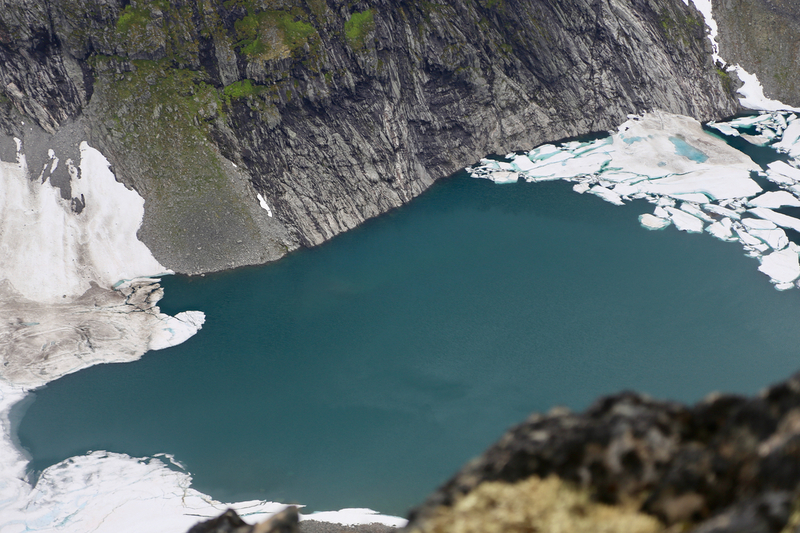 Similarly, a long way down to Svartevatnet not to mention Vike from where the ascent had started. After 15 minutes, I started my descent. The terrain was wet and slippery and extra caution was absolutely needed. Otherwise, everything worked out well. I tried to call Vike from where the river forked, but there was no coverage. Thus, I waited until I was all the way down by Hoemsbu. 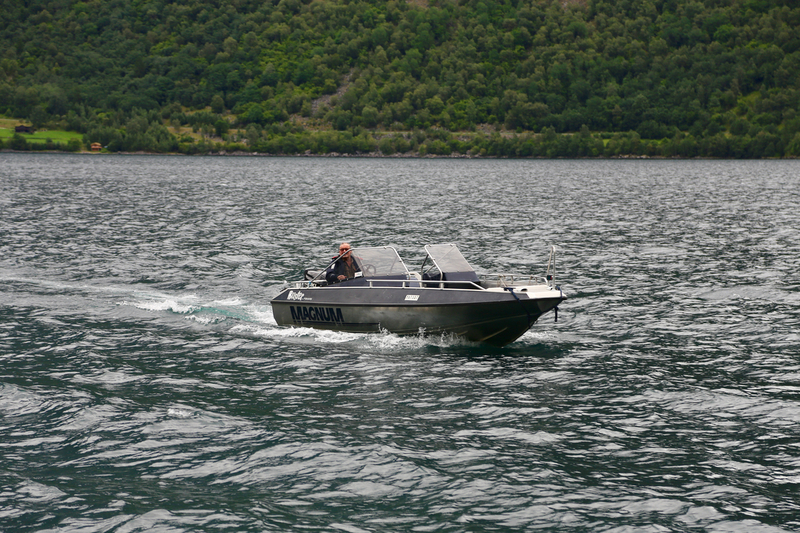 The boat came within 15 minutes and I could prepare for driving around to the best trailhead for Hauduken. Hoemtinden, as seen from Vike, the summit is to the left. Mardøla, as seen from Vike. 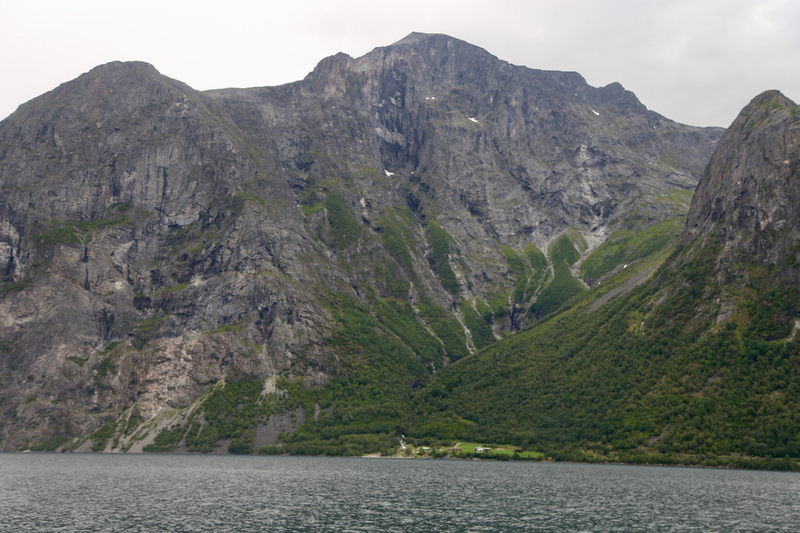 Ågottind, as seen from Hoemsbu. Vikesoksa, as seen from Hoemsbu. 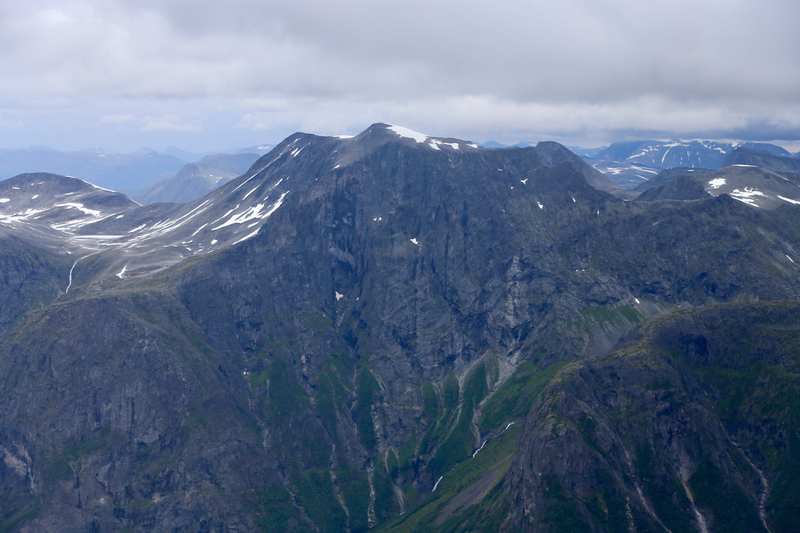 Slotthøa, as seen from the summit. 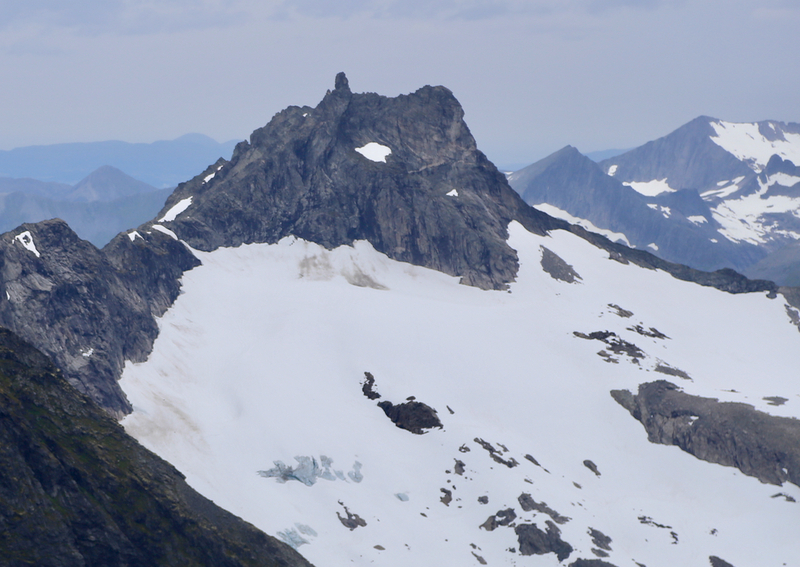 Eikesdal, as seen from the summit.